16 grants awarded to education and outreach projects in music, drama, dance and heritage sectors. This September, the Andrew Lloyd Webber Foundation has awarded grants worth a total of £270,690 to 16 projects across the UK and internationally. This includes £101,000 towards the provision of music education for young people; £67,777 to fund paid work placements for designers and lighting technicians in leading venues; £53,296 to support drama and dance programmes for young people and emerging talent; and £33,617 towards the development of skills in the heritage and crafts sector. This round of grants will also extend to the delivery of music therapy, awarding £15,000 towards its provision for seriously ill children. This new round of funding will support projects across the length and breadth of the country, from London to Birmingham, Wales to Edinburgh and Devon to Glasgow, as well as further afield in New York City. Breaking down barriers to participation in the arts, the Foundation has prioritised projects that engage young people and individuals from hard-to-reach and minority backgrounds and support the advancement of emerging talent through the provision of top quality training and paid work placements. The recipients in this round of grants are ALT., Association of Lighting Designers (ALD), Birmingham Royal Ballet, Blackheath Conservatoire of Music and the Arts, City & Guilds of London Art School, Diversity School Initiative, Ecchinswell Primary School Choir, The Landmark Trust, London Music Fund, Music in Secondary Schools Trust, Noah’s Ark Children’s Hospice, Royal Birmingham Conservatoire, Sherman Theatre, Tron Theatre, Young Music Makers of Dyfed and Young People's Chorus of New York City. Ensuring access to music education for young people has been a long-running priority for the Foundation, which has awarded several grants to projects providing greater access to teaching this autumn. 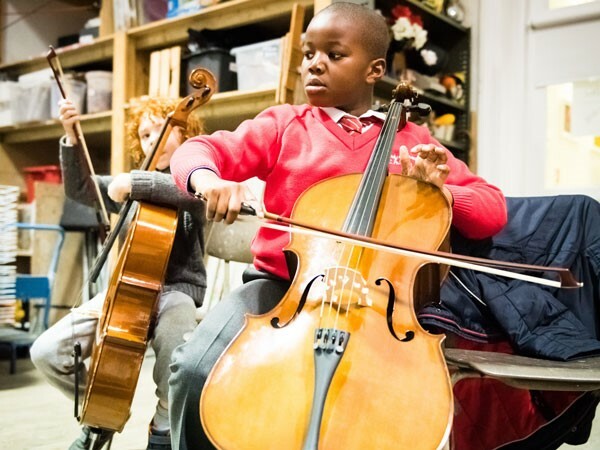 Blackheath Conservatoire of Music and the Arts has been awarded £40,000 over 2 years to run music lessons and outreach projects for disadvantaged individuals and communities in Greenwich and Lewisham. The conservatoire works closely with local schools, charities and children’s centres to identify and support young people in creative arts. Beneficiaries include those with significant musical talent from low income families or who face other barriers to participation including special educational needs, refugee status and challenging family circumstances. The Foundation will also continue to support the work of Young People’s Chorus of New York City, who received a grant of £35,000 towards music education for 1,300 young people from disadvantaged neighbourhoods in New York City, and Music in Secondary Schools Trust (MiSST), who received £10,000 towards intensive music tuition for London schoolchildren at their annual Radley Summer Residency. This year MiSST students on the residency enjoyed masterclasses from Nicola Benedetti and Wynton Masalis. Since the publication of Centre Stage in 2017, a report examining the pipeline of Black, Asian and Minority Ethnic (BAME) trained talent into the theatre industry, the Foundation has continued to champion projects that cultivate a more diverse industry. Funding an outreach programme delivering introduction to drama school workshops for young people in areas with a high density of BAME communities in Birmingham, Leicester and Sheffield, the Diversity School Initiative has been granted £10,000 over 2 years. ALT’s free actor training programme for young BAME actors from low income backgrounds is awarded £15,000 towards their project in partnership with Southwark Playhouse, The Birmingham Repertory Theatre and Citizens Theatre, Glasgow. Further support for drama and dance training for young people across the UK has been awarded to Birmingham Royal Ballet, whose Dance Track programme received £15,000 to provide free dance training to 2,600 children, and further support to 80 talented children from deprived areas in Central Birmingham. Tron Theatre, Glasgow, received £13,296 to provide workshops, masterclasses and careers advice for their Young Company, supporting their members’ transition from youth theatre to professional theatre. Supporting the conservation and appreciation of heritage across the UK is prevalent in this autumn’s round of grants with funds being allocated to The Landmark Trust and City & Guilds London Art School. The Landmark Trust, who are restoring the Grade II listed Winsford Cottage Hospital in Devon, received £23,000 to fund two apprentices on the Prince’s Trust Foundation Building Crafts course and provide in depth experience of the build to 25 students from Bridgewater College Furniture Making and Design course. The City & Guilds of London Art School received £10,617 towards bursaries for young people to experience short courses in woodcarving, stone carving and gilding, focusing on underrepresented groups to encourage diversity in the heritage sector. - £46,377 to Royal Birmingham Conservatoire over 3 years. - £15,000 to Noah’s Ark Children’s Hospice over 3 years. - £11,400 to Sherman Theatre over 3 years. - £10,000 to Association of Lighting Designers, Lumière Scheme. - £8,000 to London Music Fund over 2 years. - £6,000 to Young Music Makers of Dyfed. - £2,000 to Ecchinswell Primary School Choir over 2 years.